Polyurethane is one of the more common finishes currently being used. It does have the great qualities of being easy to use, tough and relatively inexpensive. In addition, it produces great results with a minimum of effort. There are, in general, two different kinds: water and oil-based. Oil-based poly produces a "warm" finish that is slightly yellowish but since it is oil-based it has a significant odor. Water based poly has little odor, dries fast but tends to have a somewhat "bluish" tinge to it that looks a bit "cold." 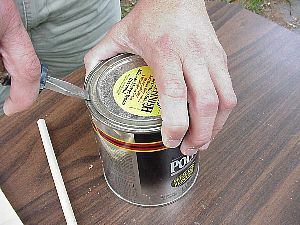 Carefully open the can. Stir the contents thoroughly, DO NOT shake the can. Doing so will introduce air bubbles into the poly and when dry will product pits in the finish. Dip the brush, foam or bristle, into the finish. Distribute the finish evenly over the surface. Make sure that the finish is nice and flat. "Tip-off" the finish by holding the brush at a 90 degree angle to the work piece. Lightly brush back and forth over the finish. When the finish dries, lightly rub it down with the steel wool. Completely remove all of the waste and re-coat. Most applications require 2 or 3 coats to provide complete protection. If you are going to use a satin or semigloss poly and want more than one coat, it is advisable to use a clear gloss poly for the first layers. Then apply the satin coat last. This will leave the grain clearly visible.